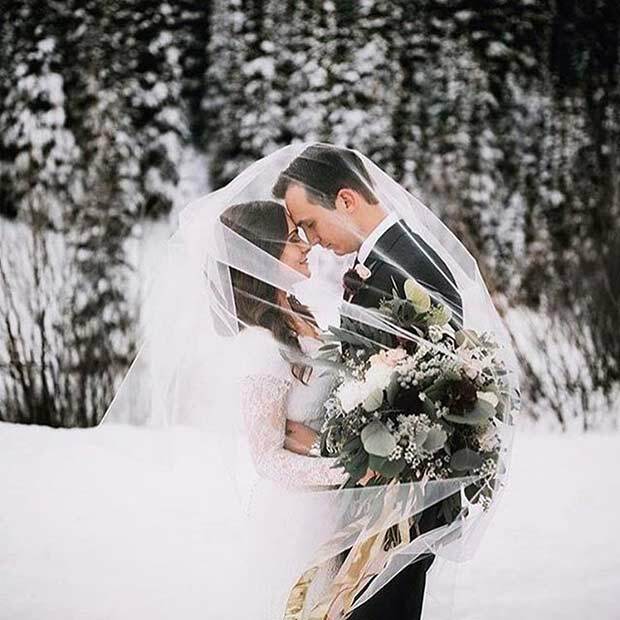 As a winter bride you can bask in the picturesque views among snowy backdrops that you will witness at your wedding as well as the enjoyment of the money you have saved. Winter is considered off-season for weddings and the rates charged by wedding venues as well as other wedding vendors are generally lower than peak wedding season rates. While it is true that winter weddings offer you lots of options for winter wedding decorations and activities, the cold weather also presents a few challenges, especially when it comes to bridal beauty and hair. Dry skin, chapped lips, and fly-aways galore, are just a few of the “fun” issues you may face with a cold-weather wedding. 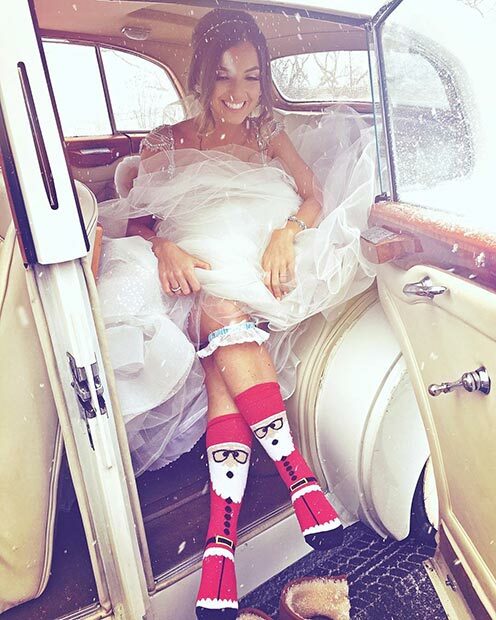 So if you are having a winter wedding, you should be aware of what every bride-to-be should know before her big (and possibly snowy) day. And as a winter bride you will want to make sure that you can stay warm without sacrificing any of the style and beauty of your wedding day look, for example by selecting one of the available gorgeous, stylish and chic headpieces for the winter bride. Let’s face it, when you’re getting married you want your wedding to be bigger and better than any wedding that anyone has ever seen before. You want a dress that only you will wear, with shoes that only you will wear, and with unique ideas that really makes your big day stand out. What’s the point in being the center of attention if you’re only going to fake into the background? If you’re looking for unique ideas for a winter wedding, you’ve come to the right place. We’ve found some absolutely amazing ideas for your big day, and we cannot wait to share them with you. Winter weddings just scream that cozy and warm atmosphere, so we feel that the cozy couple photo is a must-have. If your wedding photographer hasn’t already bounced this idea your way, it might be wise to bring it to his or her attention. It doesn’t take much – a cozy blanket, a nice cup of tea … everything you’d want for a nice and warm wedding day. We can’t think of anything we’d like more after a busy day of celebrating our love than a nice cup of hot, steaming tea! 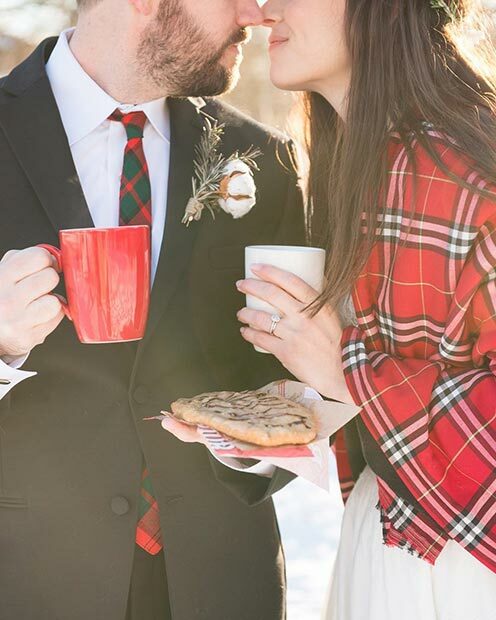 While we’re on the subjects of hot drinks, if you’re planning a winter wedding you need to come up with a way to keep your guests warm. This is even more so the case when you’ve opted for a snowy and super-cold backdrop. 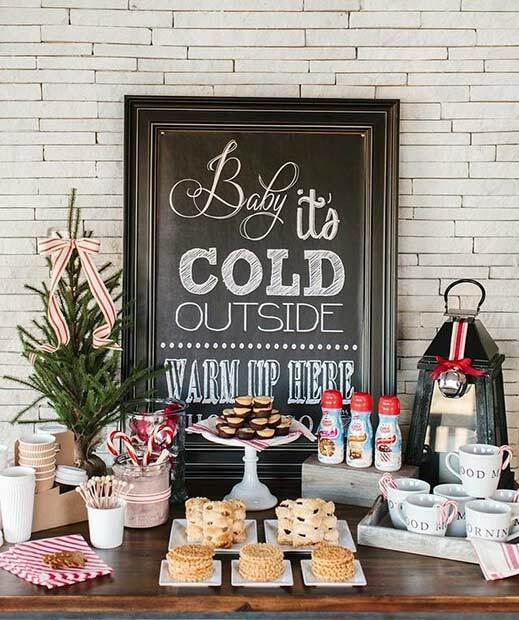 A hot chocolate bar is a great idea, not only because your guests can have their drinks exactly the way they want it, but also to keep them warm. Plus, who doesn’t really appreciate a wonderful cup of cocoa at the end of a long day? 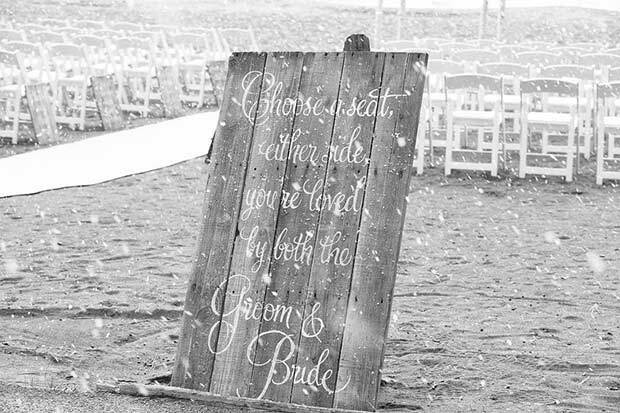 Unique ideas for a winter wedding done the right way, if you ask us. Winter might seem drab and dreary, but sometimes there are some beautiful colours that pop out of nowhere. 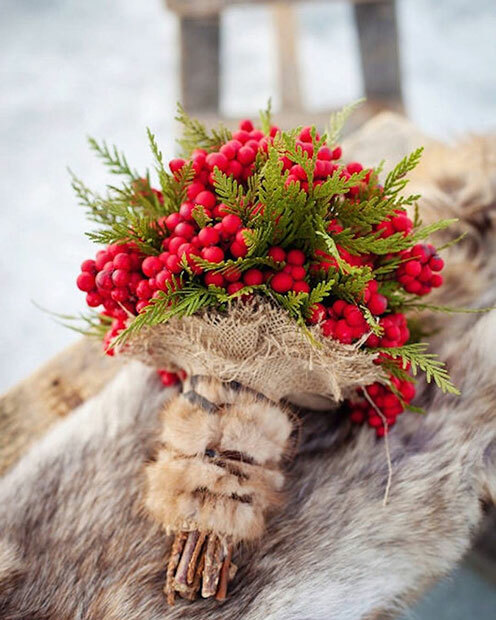 We love the way that the bright red pop of winter berries has been used in a rustic wedding bouquet. It brings a flash of colour into an otherwise quite subtle backdrop. There are a few different types of winter berries you could pick for a wedding bouquet like this one. 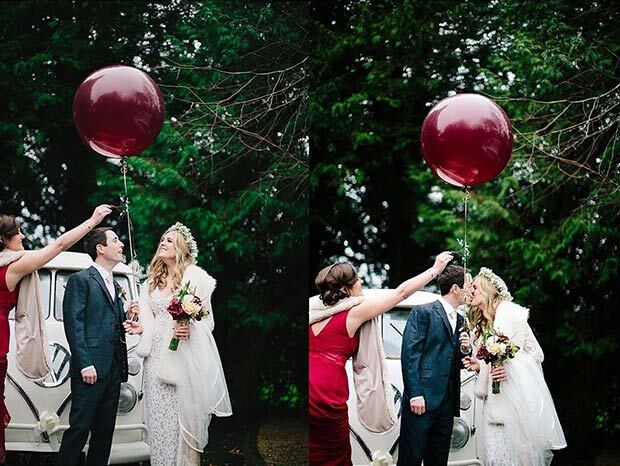 It all depends on the colours you want to go, and the style of wedding you’ve chosen. Hypericum berries are the most commonly used, and these can be in red, green, and various shades in between. 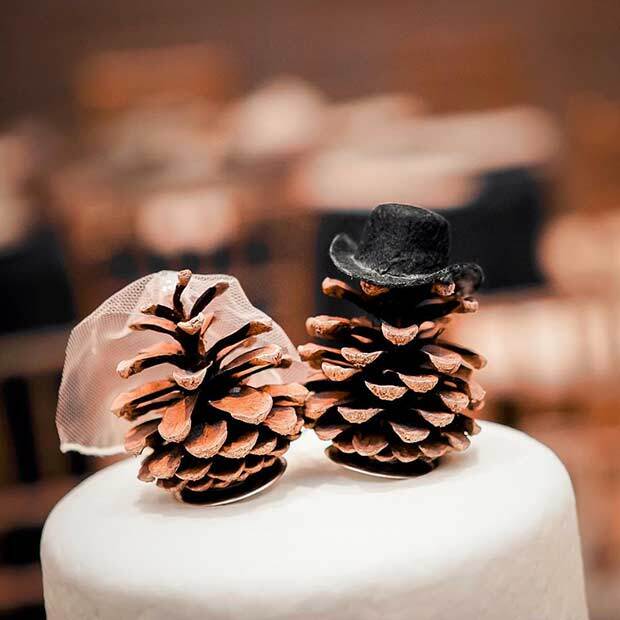 For when you want a rustic winter wedding, and you’re not that bothered about the bride and groom at the top of the cake, how about having pinecones instead? It’s a very simple idea, and you could still decorate the pinecones in the bride and groom style, just like you can see here. It’s also a lot cheaper than having bride and groom wedding toppers – no one would ever need to know that you were planning your winter wedding on a budget either! No one else would have done it, and thats what makes it one of the best unique ideas for a winter wedding. Fur coats just scream luxury, although we’re talking about faux-fur, of course. We’re not really in the market for a dead animal carcass wrapped around our beautiful dresses for a wedding day. The faux-fur coat idea is actually a really good one to opt for if you’re on the hunt for unique ideas for a winter wedding. Because they’re so on-trend for right now, you’ll have an easy time finding some that match your dresses perfectly. You’ll also be more likely find them in the exact colours and styles to match your wedding theme. Long, short, big and fluffy, or short and sweet – there are plenty of styles and designs to play around with. 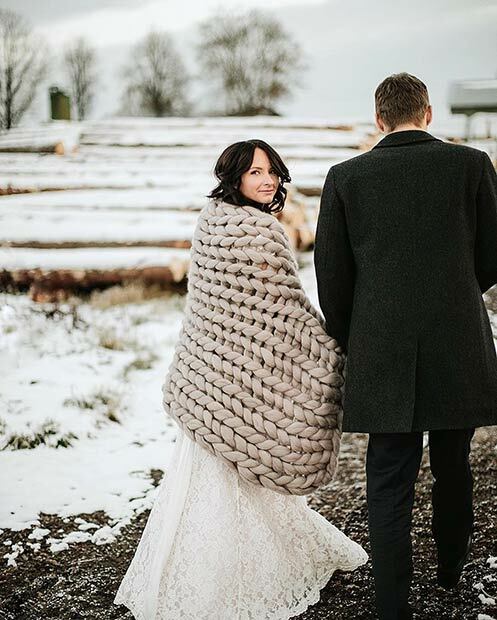 We bet your wedding guests will love the luxurious blanket you’ve essentially just told them to wear! These are easily handmade using old Christmas wreathes. 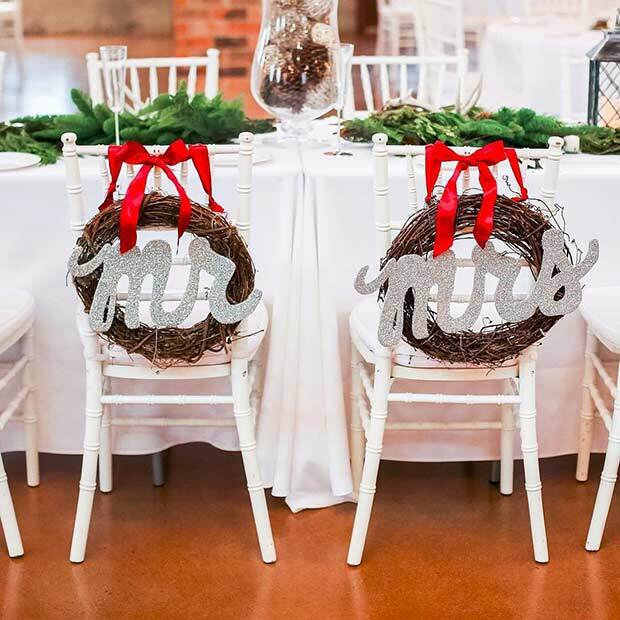 With the help of some ribbon, some silver glitter spray paint, and a ‘Mr’ and ‘Mrs’ cut-out sign (or whatever names you want to have on them), you could recreate these in no time at all. The actual names / words themselves aren’t all that difficult to make if your other half or dad has the right power tools hanging around in the shed. These chair covers are such a fabulous idea, and just perfect for a wedding day around Christmas. You could have these on just the bridge and grooms chairs, or on all the chairs at the ‘top table’. As well as the Mr. and Mrs. that you can see here, you could have the other titles of the people sat in that chair. 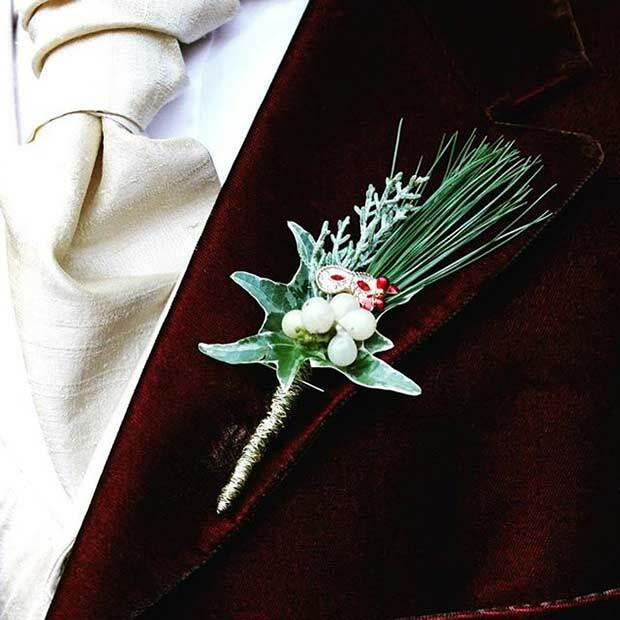 You can’t forget about the boutonniere on the big day! What better way to show off your festive side than with these beautiful mistletoe ones? As far as unique ideas for a winter wedding go, these ones are definitely one of the smallest touches, but also ones that could make the biggest impact too. Imagine all the kisses under the mistletoe that could be happening because of you tonight! As much as you want to look beautiful on your big day, you must make sure that you’re warm enough. If you don’t, all of your wedding photos are going to be of you trying to smile through gritted teeth, and before long your hands, feet, and other limbs will start to go blue. Looking good is important, but so is staying warm! Remember that with your unique ideas for a winter wedding. While we’re on the subject of staying warm, we definitely think these big and chunky woolen blankets are the way forward, and if you know someone who can crochet or knit, or who knows how to make these, you could also save a few bucks too. And get exactly the right shade to match your colour scheme! It’s all adding up, right? We know, these blankets look lovely and warm. Why wouldn’t you want to include some in your unique ideas for a winter wedding? We can’t think of a single reason. 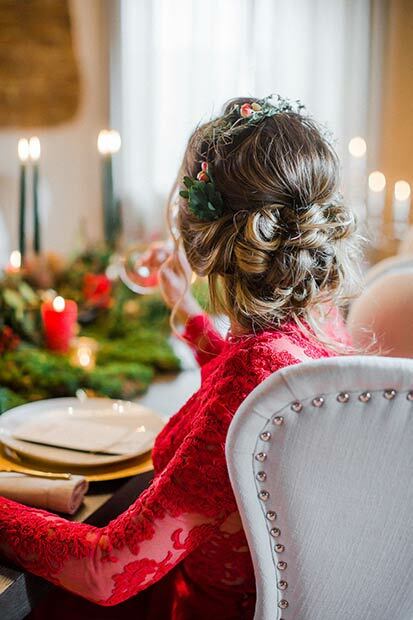 You can’t forget about your hair when you’re talking about unique ideas for a winter wedding either, and we’re a little in love with this perfect bridal updo. Some winter flowers have been added for good measure, and it all together looks so beautiful, simple and elegant. When you have such impressive detailing happening all around you on your big day, sometimes keeping things simple, just like your hair, is the way forward. Contrasts cane make such a massive impact. You definitely can’t forget about the plummeting temperatures when you’re planning a wedding during the cold season. 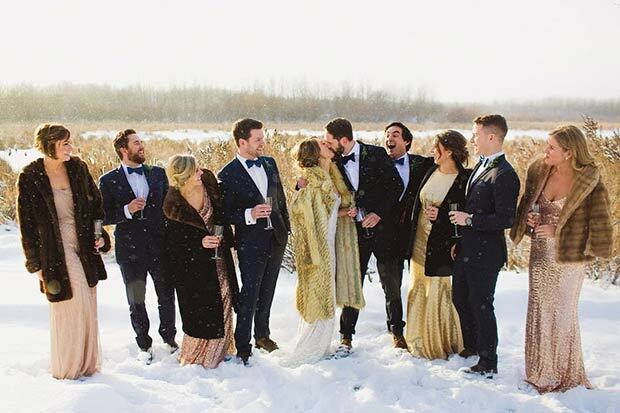 How’s this for unique ideas for a winter wedding that’ll keep your guests warm and happy? 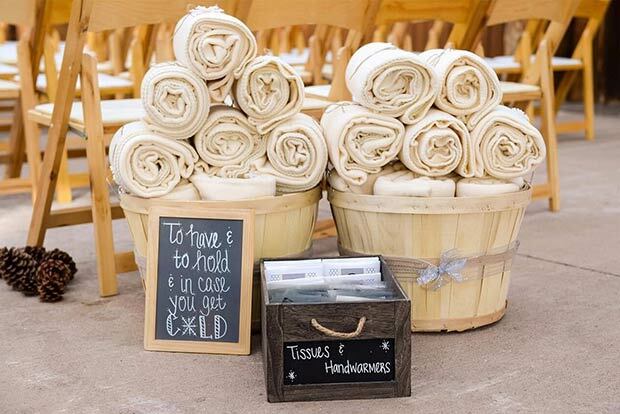 Have a couple of baskets or tubs of blankets for the guests to wrap around themselves when everything gets chilly! They’ll be happy, you’ll be happy because they’re happy, and it’s such a simple yet perfect touch. Just make sure the tub looks cute, obviously. We quite like the barrels that have been used here, but you could use rustic, old-wood pallets and wooden boxes too. What looks great against a white snowy backdrop? 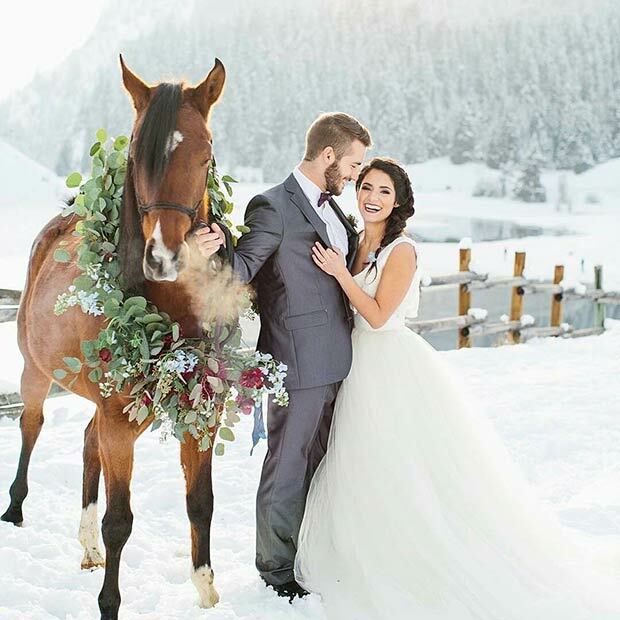 A horse, obviously, and a wreath, and a beautiful bride and groom! What else? Have a look around you when you’re looking for unique winter wedding ideas. Could the backdrop right around you work for beautiful wedding pictures? Have a chat with your wedding photographer, or a few wedding photographers, to see what kind of scenic ideas they’ve got to throw at you. You should – they’ll come up with some really incredible shots that you won’t have thought of. Picking the right wedding cake is often difficult for a bride-to-be, and there are so many things to take into consideration these days too, with everyone having allergies and blah, blah, blah. 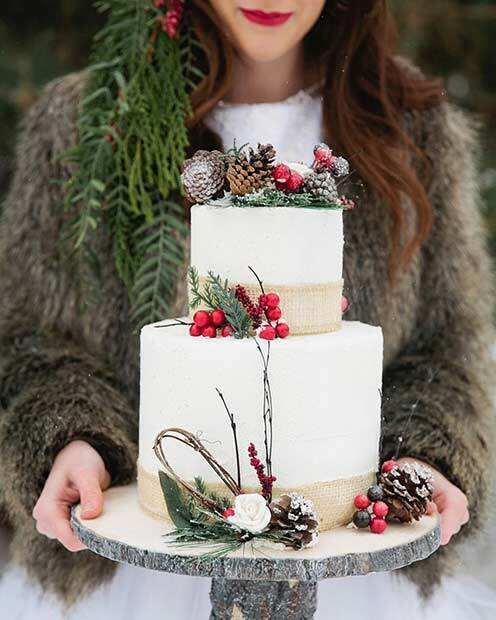 We love this wedding cake with a winter touch – simple, elegant, easy. The berries and pinecones do the talking here, and that’s kind of what you want, isn’t it? The red and white stands out really well against each other too, and it just looks so … perfect. Well, we think so anyway. We’d love to know what you think about it! It’s another simple and clever idea that many of you probably won’t have thought of, but why not use old tree branches and twigs to create a framework like these? 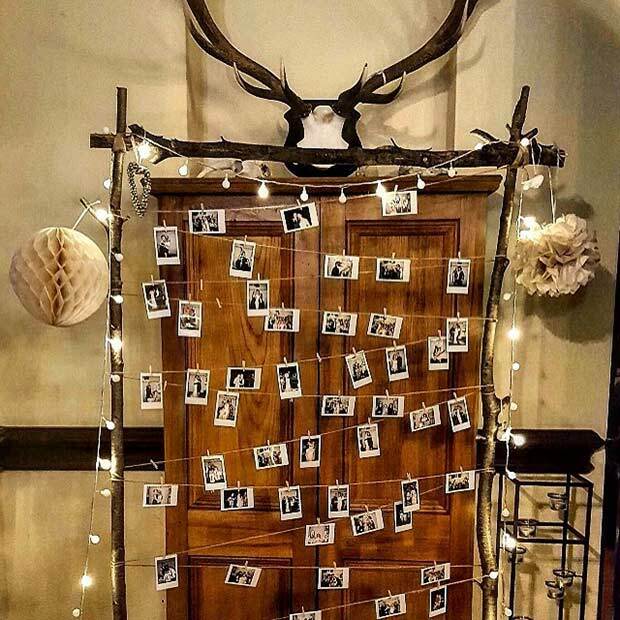 You could have a polaroid doing the rounds at your big day, and when the photos are printed out and shaken all around, you could have everyone peg their favourites to the rope that you’ve twisted throughout it. Some fairy lights help to finish it all off nicely, and it becomes so much more than just wedding day decor once the big day is actually over. You could take this home and pop it on a wall somewhere, a beautiful rustic reminder of the happiest day of your life. Wedding invitations are another thing that often causes the bride and groom much discomfort and pain, mostly because it’s impossible to know what you want. 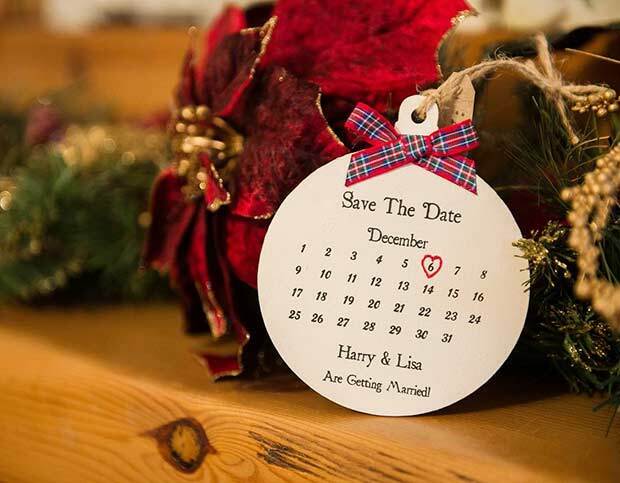 If you’re having a close-to-Christmas wedding, now about these Save-the-Date cards? They’re winter-themed, and festively themed too, and they’re very simple. It’s all the information you need, right where you need it. Even better than that, the bauble design could even be hung from the tree as a really clever way to combine your wedding in with Christmas. It makes for a great keepsake too, don’t you think? 16. CHOOSE A SEAT, NOT A SIDE. When you get married, you join two families together. It’s a really beautiful thought, and we love the way that it is an idea featured highly in this wedding. Rather than picking a seat dependant on whether you know the bride or groom, you just pick a seat wherever you damn well feel like it. And if that’s next to the groom’s cousin but you’re the bride’s friend, who cares? The board itself would be really easy to make before the big day at home too, using older bits of wood together. You can use stencils (or a stencil cutter) to get the words right, or you could even paint them on yourself if you have a good enough hand. Either way, however you choose to make it happen, we definitely think you should. What a beautiful idea. If you’re having a wedding near Christmas, you can’t not have the under-the-mistletoe kiss photo. It would be like having Christmas without the tree. Again, have a chat with your photographer and one of the people int he wedding party to make sure both the camera and the mistletoe just happen to be around at the same time. We bet you’ll be glad you did. What comes with winter? Snow? What else? Ice, that’s what! So … why combine the two ideas? Why not go ice skating?! 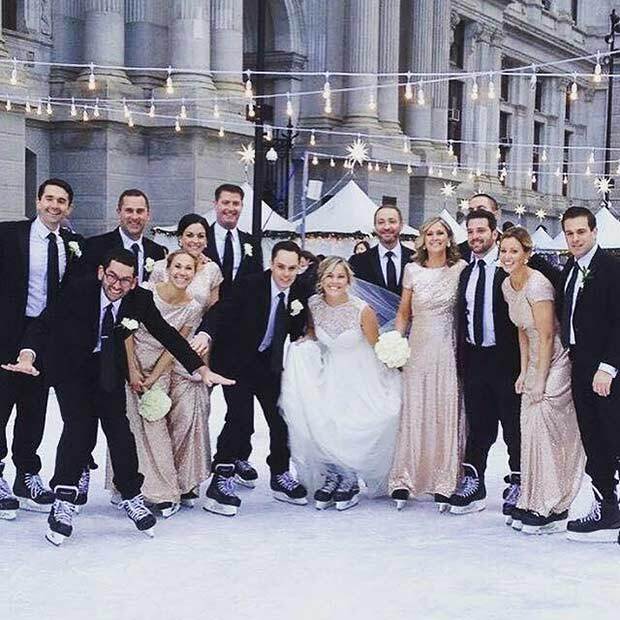 If you regularly go ice skating, this makes perfect sense for unique ideas for a winter wedding, but we probably wouldn’t advise this if you’ve never put on a pair of skates in your life. You should at least have lessons first. Do you want to be the bride who falls over on the ice in her beautiful dress? What if you rip it?! 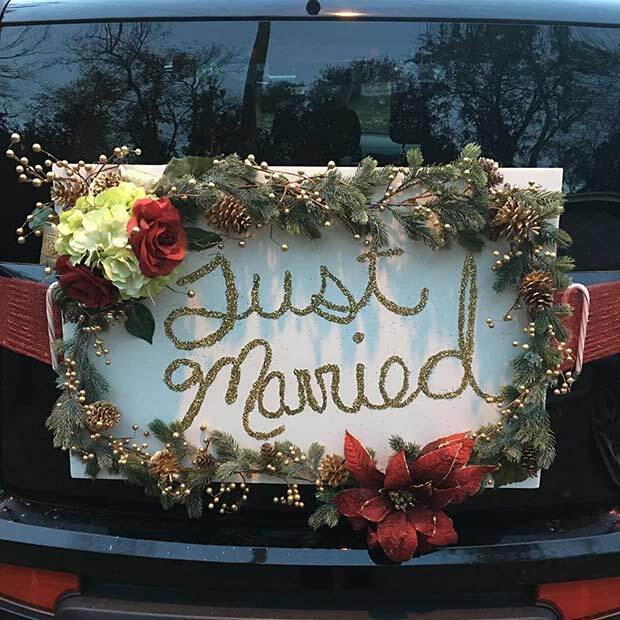 You can’t forget about the ‘Just Married’ sign on the car, and we love this festive ‘Just Married’ wreath idea, another great way of mixing in Christmas traditions with your big day. Another creation easily made at home, and one you could even get the kids involved with (child labour! ), a piece of board with some beautiful glued-on embellishments, plus glitter signage sounds like a really good idea. Everyone knows it’s cold outside, so you might as well make a feature out of it when your’e getting married in the winter. This station at your wedding is basically a ‘warmth station’, with everything you need to make a hot drink that you can dunk a sweet biscuit into. You could have tea, coffee, hot chocolates, whatever you like, it’s your big day after all. Just add a miniature Christmas tree and some candy canes for festive measure, and it’s perfect for unique ideas for a winter wedding. If you can’t have your mom and dad at your big day for whatever reason, you could still have them there in spirit. 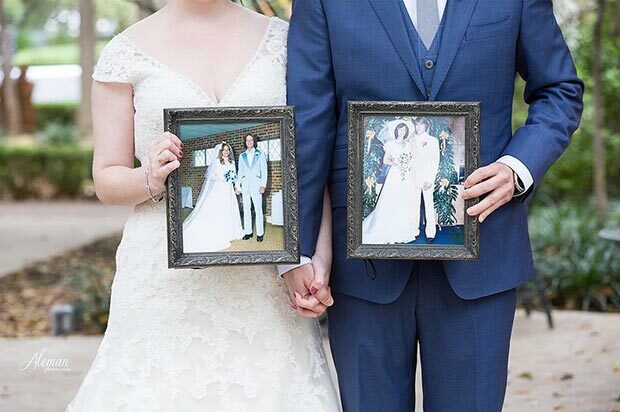 We really like the idea of the bride and groom holding up pictures of their parents on their wedding day, during the big day. It’s a really memorable photo, and could even be used when your parents are there too. You could build this up as a collection of photos over time – your children also taking a picture with your picture in, and then theirs after that. You might even start off a family tradition. Doesn’t that sound like an awesome idea? The veil is usually pushed out of the way when you have your wedding photos taken, but we liked this idea for unique winter wedding ideas. Rather than have the veil tucked out of the way, or blowing away from the face in the breeze, why not have it wrapped around you? Almost like a protective bubble? We think it sounds like a really cute idea, and the right wedding photographer will be able to master this one for you. Just make sure you tell you what kind of thing you’re looking for first, maybe show them this picture? 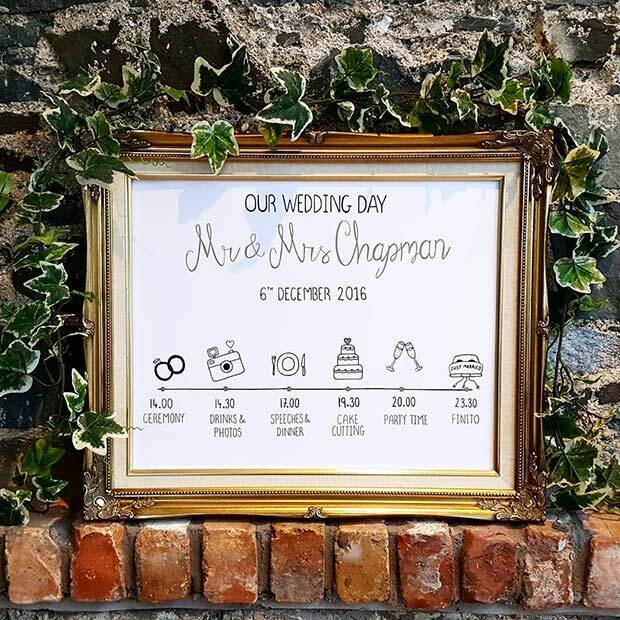 And for when you can’t really be bothered to print out ‘programs’ of your big day, how about just having a couple of timelines printed out, placing them in beautiful gold frames, and having them dotted in the appropriate places around your wedding location. It’s simple, everyone will know where they should be at whatever time they need to be there, and it’ll be one less thing for you to worry about. Plus, getting all that stuff printed out is expensive. Every little helps! There are some fabulous and unique ideas for a winter wedding here, and we hope that you’ve found plenty of inspiration to create a day that is perfect for you. You should most definitely come back and let us know how your big day went, and what pictures you managed to grab some inspo from. The post 23 Unique Ideas for a Winter Wedding appeared first on crazyforus.